In Musqueam sniw̓ (teachings), salmon are sacred and are considered to be relatives who sacrifice themselves so that we may survive. They are a symbol of abundance, prosperity, and wealth. They are our livelihood. We have the responsibility to respect all things, which includes protecting our salmon populations. A continued decline in their numbers would be devastating for our people. It is accepted among the Coast Salish Nations that the Musqueam were the sentinels of the stal̓əw̓ (Fraser River) and protectors of the great resources of the estuary. Fishing season in Musqueam is a family affair. If you ask anyone in our community of their fondest childhood memories, connecting them to their family and ancestors, many will tell you fishing stories. For this artwork, I reached out to members of my community for images of fishing on the river. In many of these photos, you’ll find my grandfather, Robert Point. Our culture was very important to him, and he always shared his knowledge and teachings with all of his children and grandchildren. The hən̓q̓əmin̓əm̓ name for Garry Point is q̓ʷeyaʔχʷ and the area had summer fishing camps and villages. My surname, Point, is connected to the colonial place names across Richmond and the Lower Mainland. As sentinels, Musqueam people were responsible for oversight of headlands, places now known by the names Point Roberts, Garry Point and Point Grey. We say that is why the Catholic priests gave them the surname “Point”. This history connects me not only to my ancestors, but also to this place. As a community and First Nation, Musqueam has always practiced strong teachings. We have lived here and fished salmon from stal̓əw̓, the Fraser River since time immemorial. This knowledge continues to be passed on through families to our future generations. Many non-Indigenous residents of Richmond are unaware of our history here. It is important for everyone to know that this city sits on the traditional, ancestral, and unceded territories of the Musqueam people. 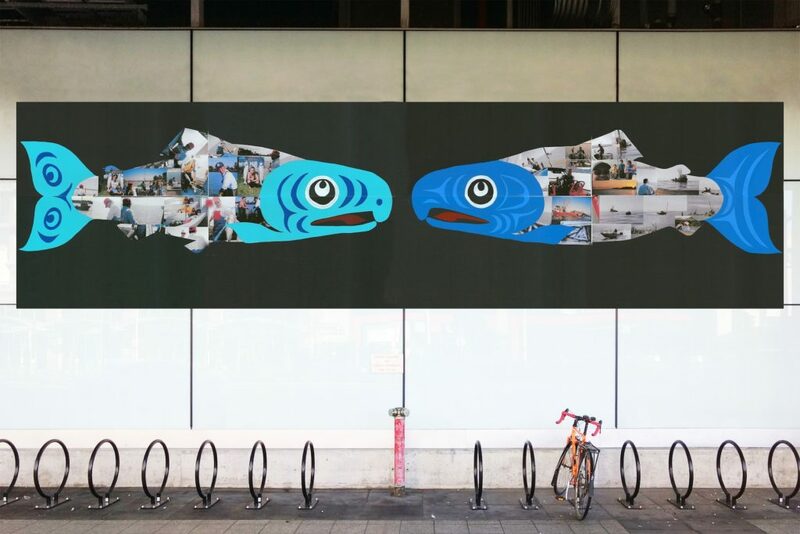 Diamond Point was selected for this station by a panel of Musqueam artists and project mentor, artist Krista Belle Stewart (Syilx Nation) from an open call for a Musqueam artist or collective. Diamond Point is a contemporary Coast Salish artist and a member of the Musqueam First Nation. Diamond currently resides in Ladner, however grew up and was raised on the Musqueam Indian Reserve since birth. She describes herself as a contemporary artist because she feels that her artwork belongs within the present, with her techniques and style constantly developing and changing through out her experiences. Being a young, contemporary artist, Diamond believes it is important to continue developing her artwork as present and current. In her work, Diamond incorporates traditional Coast Salish design elements as a way to represent the beautiful teachings and history her ancestors have passed down through generations since time immemorial. In 2014, Diamond had the privilege of showcasing her work in the Claiming Space: Voices of Urban Indigenous Youth exhibition through the Museum of Anthropology, Vancouver. More recently in 2018, Diamond created designs for the new Totem Park residences at the University of British Columbia (UBC) that have been named after traditional Musqueam village sites, c̓əsnaʔəm, həm̓ləsəm̓, and q̓ələχən. This coming May 2019, Diamond’s artwork will be used as the logo for the Humanities, Arts, Science, Technology Alliance and Collaboratory (HASTAC) conference being held at UBC, which sits on traditional, ancestral and unceded territory of the Musqueam people. Apart from being an artist, Diamond also has a passion towards a career in education. She currently studies at UBC and is in the NITEP Indigenous Teacher Education Program in the Faculty of Education. Upon graduation, Diamond hopes to work as a secondary Socials and Art teacher. Diamond feels incredibly fortunate to have had the opportunities to express her Indigenous identity and culture within many realms. As an emerging artist, she intends to create artwork that connects the old with the new but remain respectful to traditional Coast Salish design elements. Above: Diamond Point, Fraser River Families, 2019, installation mockup for Richmond-Brighouse Station.